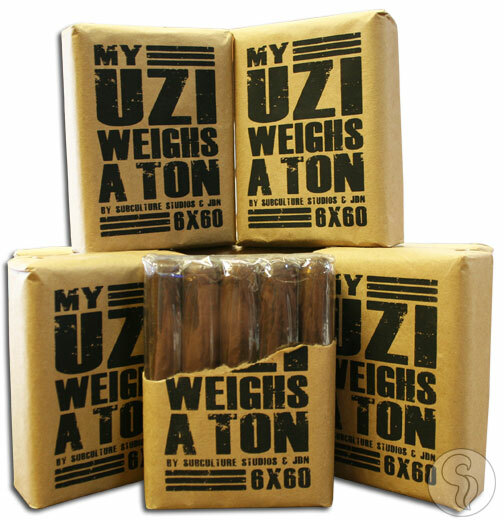 Jonathan Drew's personal joint project with Joya De Nicaragua, My Uzi Weighs A Ton (MUWAT), is available only in sizes with a 60 ring gauge. MUWAT is made at the Joya de Nicaragua factory with leaf mostly from Drew Estate, including a San Andreas maduro capa wrapper, Connecticut capote binder, and Brazillian mata fina filler. Also used as filler is Nicaraguan leaf from Joya de Nicaragua's tobacco stocks MUWAT is available in three large sizes: Robusto (5 x 60), Toro (6 x 60), and Churchill (7 x 60) and currently is packed in celloed bundles of 10. This medium bodied smoke will surely please the fans of Drew Estate's traditional cigars.